"Cradle to Cradle" redirects here. For the 2002 book, see Cradle to Cradle: Remaking the Way We Make Things. In 2002, Braungart and William McDonough published a book called Cradle to Cradle: Remaking the Way We Make Things, a manifesto for cradle to cradle design that gives specific details of how to achieve the model. The model has been implemented by a number of companies, organizations and governments around the world, predominantly in the European Union, China and the United States. Cradle to cradle has also been the subject of many documentary films, including the critically acclaimed Waste=Food. In the cradle to cradle model, all materials used in industrial or commercial processes—such as metals, fibers, dyes—fall into one of two categories: "technical" or "biological" nutrients. Technical nutrients are strictly limited to non-toxic, non-harmful synthetic materials that have no negative effects on the natural environment; they can be used in continuous cycles as the same product without losing their integrity or quality. In this manner these materials can be used over and over again instead of being "downcycled" into lesser products, ultimately becoming waste. Biological Nutrients are organic materials that, once used, can be disposed of in any natural environment and decompose into the soil, providing food for small life forms without affecting the natural environment. This is dependent on the ecology of the region; for example, organic material from one country or landmass may be harmful to the ecology of another country or landmass. The two types of materials each follow their own cycle in the regenerative economy envisioned by Keunen and Huizing. Material health, which involves identifying the chemical composition of the materials that make up the product. Particularly hazardous materials (e.g. heavy metals, pigments, halogen compounds etc.) have to be reported whatever the concentration, and other materials reported where they exceed 100 ppm. For wood, the forest source is required. The risk for each material is assessed against criteria and eventually ranked on a scale with green being materials of low risk, yellow being those with moderate risk but are acceptable to continue to use, and red for materials that have high risk and need to be phased out. Grey for materials with incomplete data. The method uses the term 'risk' in the sense of hazard (as opposed to consequence and likelihood). Material reutilization, which is about recovery and recycling at the end of product life. Assessment of energy required for production, which for the highest level of certification needs to be based on at least 50% renewable energy for all parts and subassemblies. Water, particularly usage and discharge quality. Social responsibility, which assesses fair labor practices. The certification is available at several levels: basic, silver, gold, platinum, with more stringent requirements at each. Prior to 2012, MBDC controlled the certification protocol. Currently, many human beings come into contact or consume, directly or indirectly, many harmful materials and chemicals daily. In addition, countless other forms of plant and animal life are also exposed. C2C seeks to remove dangerous technical nutrients (synthetic materials such as mutagenic materials, heavy metals and other dangerous chemicals) from current life cycles. If the materials we come into contact with and are exposed to on a daily basis are not toxic and do not have long term health effects, then the health of the overall system can be better maintained. For example, a fabric factory can eliminate all harmful technical nutrients by carefully reconsidering what chemicals they use in their dyes to achieve the colours they need and attempt to do so with fewer base chemicals. The use of a C2C model often lowers the financial cost of systems. For example, in the redesign of the Ford River Rouge Complex, the planting of Sedum (stonecrop) vegetation on assembly plant roofs retains and cleanses rain water. It also moderates the internal temperature of the building in order to save energy. The roof is part of an $18 million rainwater treatment system designed to clean 20 billion US gallons (76,000,000 m3) of rainwater annually. This saved Ford $50 million that would otherwise have been spent on mechanical treatment facilities. If products are designed according to C2C design principles, they can be manufactured and sold for less than alternative designs. They eliminate the need for waste disposal such as landfills. Cradle to Cradle a play on the phrase "Cradle to Grave", implying that the C2C model is sustainable and considerate of life and future generations. Technical nutrients are basically inorganic or synthetic materials manufactured by humans—such as plastics and metals—that can be used many times over without any loss in quality, staying in a continuous cycle. Biological nutrients and materials are organic materials that can decompose into the natural environment, soil, water, etc. without affecting it in a negative way, providing food for bacteria and microbiological life. Materials are usually referred to as the building blocks of other materials, such as the dyes used in colouring fibers or rubbers used in the sole of a shoe. Downcycling is the reuse of materials into lesser products. For example, a plastic computer case could be downcycled into a plastic cup, which then becomes a park bench, etc. ; this may eventually lead to waste. In conventional understanding, this is no different from recycling that produces a supply of the same product or material. Waste = Food is a basic concept of organic waste materials becoming food for bugs, insects and other small forms of life who can feed on it, decompose it and return it to the natural environment which we then indirectly use for food ourselves. The question of how to deal with the countless existing technical nutrients (synthetic materials) that cannot be recycled or reintroduced to the natural environment is dealt with in C2C design. The materials that can be reused and retain their quality can be used within the technical nutrient cycles while other materials are far more difficult to deal with, such as plastics in the Pacific Ocean. One effective example is a shoe that is designed and mass-produced using the C2C model. The sole might be made of "biological nutrients" while the upper parts might be made of "technical nutrients." The shoe is mass-produced at a manufacturing plant that utilises its waste material by putting it back into the cycle; an example of this is using off-cuts from the rubber soles to make more soles instead of merely disposing of them (this is dependent on the technical materials not losing their quality as they are reused). Once the shoes have been manufactured, they are distributed to retail outlets where the customer buys the shoe at a fraction of the price they would normally pay for a shoe of comparable aspects; the customer is only paying for the use of the materials in the shoe for the period of time that they will be using the shoe. When they outgrow the shoe or it is damaged, they return it to the manufacturer. When the manufacturer separates the sole from the upper parts (separating the technical and biological nutrients), the biological nutrients are returned to the natural environment while the technical nutrients are used to create the sole of another shoe. Another example of C2C design is a disposable cup, bottle, or wrapper made entirely out of biological materials. When the user is finished with the item, it can be disposed of and returned to the natural environment; the cost of disposal of waste such as landfill and recycling is eliminated. The user could also potentially return the item for a refund so it can be used again. Ford Model U is a design concept of a car, made completely from cradle-to-cradle materials. It also uses hydrogen propulsion. Cradle-to-cradle shoes have been made through the Nike Considered project. Sewage sludge processing plants are facilities that create fertiliser from sewage sludge. 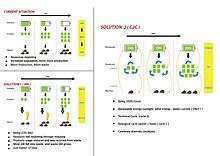 This approach is green retrofit for the current (inefficient) system of organic waste disposal; as composting toilets are a better approach in the long run. The X List – substances that must be phased out, such as teratogenic, mutagenic, carcinogenic. Products that adhere to all steps can generally be granted a certification. Two certifications used for cradle-to-cradle products include Leadership in Energy and Environmental Design (LEED) and BRE Environmental Assessment Method (BREEAM). C2C principles were first applied to systems in the early 1990s by Braungart's Hamburger Umweltinstitut (HUI) and The Environmental Institute in Brazil for biomass nutrient recycling of effluent to produce agricultural products and clean water as a byproduct. In 2007, MBDC and the EPEA formed a strategic partnership with global materials consultancy Material ConneXion to help promote and disseminate C2C design principles by providing greater global access to C2C material information, certification and product development. As of January 2008, Material ConneXion's Materials Libraries in New York, Milan, Cologne, Bangkok and Daegu, Korea started to feature C2C assessed and certified materials and, in collaboration with MBDC and EPEA, the company now offers C2C Certification, and C2C product development. The Lyle Center for Regenerative Studies incorporates cradle to cradle systems throughout the center. The use of the term C2C is replaced with Regenerative. The Chinese Government is constructing many cities like Huangbaiyu based on C2C principles, utilising the rooftops for agriculture. The Ford River Rouge Complex redevelopment. Cleaning 20 billion US gallons (76,000,000 m3) of rainwater annually. Fashion Positive, an initiative to assist the fashion world in implementing the cradle-to-cradle model in five areas: material health, material reuse, renewable energy, water stewardship and social fairness. 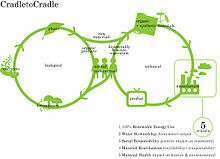 The Cradle to Cradle model can be viewed as a framework that considers systems as a whole or holistically. It can be applied to many aspects of human society, and is related to Life cycle assessment. See for instance the LCA based model of the Eco-costs, which has been designed to cope with analyses of recycle systems. The Cradle to Cradle model in some implementations is closely linked with the Car-free movement, such as in the case of large-scale building projects or the construction or redevelopment of urban environments. It is closely linked with passive solar design in the building industry and with permaculture in agriculture within or near urban environments. An earthship is a perfect example where different re-use models are used, cradle to cradle and permaculture. A major constraint in the optimal recycling of materials is that at civic amenity sites, products are not disassembled by hand and have each individual part sorted into a bin, but instead have the entire product sorted into a certain bin. This makes the extraction of rare earth elements and other materials uneconomical (at recycling sites, products typically get crushed after which the materials are extracted by means of magnets, chemicals, special sorting methods, ...) and thus optimal recycling of, for example metals is impossible (an optimal recycling method for metals would require to sort all similar alloys together rather than mixing plain iron with alloys). Obviously, disassembling products is not feasible at currently designed civic amenity sites, and a better method would be to send back the broken products to the manufacturer, so that the manufacturer can disassemble the product. These disassembled product can then be used for making new products or at least to have the components sent separately to recycling sites (for proper recycling, by the exact type of material). At present though, few laws are put in place in any country to oblige manufacturers to take back their products for disassembly, nor are there even such obligations for manufacturers of cradle-to-cradle products. One process where this is happening is in the EU with the Waste Electrical and Electronic Equipment Directive. Criticism has been advanced on the fact that McDonough and Braungart previously kept C2C consultancy and certification in their inner circle. Critics argued that this lack of competition prevented the model from fulfilling its potential. Many critics pleaded for a public-private partnership overseeing the C2C concept, thus enabling competition and growth of practical applications and services. McDonough and Braungart responded to this criticism by giving control of the certification protocol to a non-profit, independent Institute called the Cradle to Cradle Products Innovation Institute. McDonough said the new institute "will enable our protocol to become a public certification program and global standard." The new Institute announced the creation of a Certification Standards Board in June 2012. The new board, under the auspices of the Institute, will oversee the certification moving forward. Experts in the field of environment protection have questioned the practicability of the concept. Friedrich Schmidt-Bleek, head of the German Wuppertal Institute called his assertion, that the "old" environmental movement had hindered innovation with its pessimist approach "pseudo-psychological humbug". I can feel very nice on Michael's seat covers in the airplane. Nevertheless I am still waiting for a detailed proposal for a design of the other 99.99 percent of the Airbus 380 after his principles. In 2009 Schmidt-Bleek stated that it is out of the question that the concept can be realized on a bigger scale. Some claim that C2C certification may not be entirely sufficient in all eco-design approaches. Quantitative methodologies (LCAs) and more adapted tools (regarding the product type which is considered) could be used in tandem. The C2C concept ignores the use phase of a product. According to the Variants of Life Cycle Assessment the entire life cycle of a product or service has to be evaluated, not only the material itself. For many goods e.g. in transport, the use phase has the most influence on the environmental footprint. E.g. the more lightweight a car or a plane the less fuel it consumes and consequently the less impact it has. Braungart fully ignores the use phase. It is safe to say that every production step or resource-transformation step needs a certain amount of energy. The C2C concept foresees an own certification of its analysis and therefore is in contradiction to international ISO standards 14040 and 14044 for Life Cycle Assessment whereas an independent and critical review is needed in order to obtain comparative and resilient results. Independent external review. 1 2 3 4 Cradle to Cradle: Remaking the way we make things, 2002. ↑ Lovins, L. Hunter (2008). Rethinking production in State of the World 2008, pp. 38–40. 1 2 "Ask the Experts: Why Hasn't Cradle-to-Cradle Design Caught On Yet?" ↑ "Archived copy". Archived from the original on May 5, 2007. Retrieved June 30, 2007. ↑ Friedman, Arthur (15 November 2014). "Stella McCartney, Amber Valletta and Alysia Reiner on Fashion Positive". Women's Wear Daily. ↑ "Cradle to Cradle urgently needs a Dutch private partnership"
↑ "Method, Steelcase Join New Standards Board at Cradle to Cradle"
↑ He is referring to Cradle-to-Cradle seat cushions Braungart developed for the Airbus 380. ↑ "Cradle to Cradle Certification"
↑ "EPEA institute approach: Assess, Review, certify itself "
↑ "ILCD Handbook Review schemes p6f"
Wikimedia Commons has media related to Cradle to Cradle.